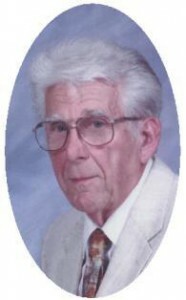 Philip H. Steffen, 87, of E Monroe Street, Port Washington died at his residence on June 21, 2009. He was born May 5, 1922 in Fredonia Wisconsin to Lawrence and Alice Gilson Steffen. He graduated from Port Washington High School in 1940 and entered the Merchant Marines, serving in the Pacific during World War Two. He married Ruth M. Bossler of Port Washington, Wisconsin on October 28, 1950 at St. Mary’s Church in Port Washington. After his military service Philip was a cook at the former Mayer Hotel in Port Washington, and worked a couple of factory jobs. He later began working for the Wisconsin Electric Power Plant in Port Washington in 1958 and retired in 1987. He was a member of St. Peter’s Church and the International Association of Operating Engineers, Local 317. In his youth he loved to play softball for old city leagues fastpitch and slowpitch. Later took up golf and was active for years in the Sundowners League at Hawthorne Hills; and enjoyed bowling at Belgium Community Center. His wife was the love of his life and preceded him in death February 19, 2007. He was a solid family man and avid sprots fan. Philip is survived by his sons Gary (Judy) Steffen and Paul (Kim) Steffen both of Port Washington and grandchildren Aaron, Noelle, Jordan, Alexandra and Kelsey. Further survived by brothers Robert (Bernice) Steffen of Crivitz and John (Regina) Steffen of Cedar Grove, sister-in-law Joan (Peter) Albers of Kewauskum, other relatives and friends. Fr. Karl Acker will celebrate Mass of Christian Burial 7 pm Friday, June 26, 2009 at St. Peter of Alcantara Catholic Church, 1800 N Wisconsin Street, Port Washington. Entombment parish cemetery. Visitation 4 – 7 pm Friday AT CHURCH with a 4 pm Rosary. Memorials to Wisconsin Parkinson’s Association (945 N 12th Street, Suite 4602 Milwaukee, WI 53233) or St. Peter’s Parish appreciated.